Just wanted to thank everyone for your prayers. I had a wonderful trip! It has been interesting processing this last month, I haven’t ever done anything like this before and started realizing I didn’t have a “box” to put it in mentally. So when my teammates would ask me how I felt about going home it was kind of confusing to me to not really feel much of anything. I was definitely looking forward to coming home, but I also was a little sad to leave Mongolia. Some things were hard to deal with for sure this past month, but overall I had a really good time. Our team leader thankfully had some processing questions that we had to fill out which was helpful. Interestingly, the hardest things for me were relational. When you are around the same people for month every day, you start encountering conflict. It was usually few and far between, but it was still hard to have conflict with people. I’m still trying to get it through my head that conflict is good and when done in a healthy way (once you resolve it) will bring people closer together. It’s so good to talk about things with people and not shove it under the rug. One of my best friends Shalyn has learned how to have healthy conflict with people and I’ve learned a LOT from her about not taking things personally and not taking things out on people. I’ve learned that no one can make me feel anything, how I feel is my own choice. If I’m frustrated or annoyed, it’s my choice to feel that way, people may do things that aren’t nice or honoring, but how they act and think is based on their own experience. Each person has their own way of viewing the world, their own hurts they are working out of, and their own opinions. I’m learning that I’m just human and will never be perfect (that’s God’s job) so all I can do is my best. That stuff finally clicked in my head over the past months. What really challenges me to love unconditionally is when other people start taking things out on me and not honoring me. The instinct to retaliate comes right up and the thought “that’s not fair!” Rises to the surface. But when conflicts arise with those in my life and they don’t know how to not take things personally or don’t know how to not treat me based on how they are feeling, it’s really hard to have healthy conflict. So it really became a choice for me to continue loving certain people. The thought I kept coming back to was “if God loves them, I will love them” also, the Bible sort of commands us to love our neighbor lol. I usually have to walk myself through (more likely it’s God walking me through..) the thought process, “My worth isn’t in others opinions of me, I don’t have to prove or defend myself, I am seen by God and he loves what he sees and says I have worth and value because I am his.” Part of healthy conflict is trying to see things from the other’s point of view. Once I do that, I try to think, am I doing what they said I’m doing? Was I being selfish or dishonoring, etc? I pray and ask the Holy Spirit if there was any of that in me. I try to the best I can, look at it objectively and own my part of the situation. After I do that I don’t take any more responsibility. I used to just run away from conflict because I was afraid of being attacked, or more likely afraid of finding out I did something wrong because I was always trying to be perfect. My worth was in doing things well, and also other’s opinions of me. So I hated when someone was upset with me and did everything I could to fix it. Then I realized it’s ok if someone is upset with me, and it’s so good to talk about it. It’s become talking to me, not fighting to work through issues with people. The Bible also says a person is stupid if they can’t take correction (literally! Proverbs 12:1) so I definitely want to be a person who is teachable. I want people to be able to come to me and tell me I’m doing something dishonoring or off, not only because the bible says it’s good, but because I don’t want anything holding me back from getting closer to Jesus! I also used to take all the responsibility just so the conflict would be over. But that isn’t healthy either. So I do my best to own what I did, apologize for it, and hope and pray the other party does the same, since it usually isn’t just all one person who creates conflict. It’s hard however, when that doesn’t get you anywhere and the other person isn’t willing to back down or see where they did wrong. All I want to do it just not be their friend anymore and run away. But that isn’t loving or Christ-like. Jesus stayed with me in my brokenness, he stuck it out with me and helped me when I was believing and acting out of lies. When I wasn’t a very nice person, Jesus was still there for me, so I want to be there for other people. So patience, kindness, and unconditional love was cultivated this trip for sure! God also was teaching me that when I know the other person won’t receive correction well or isn’t in a place to have healthy conflict, when they present me with a complaint or their opinion, it’s ok to be silent. I don’t have to prove my point or that I’m right, because it isn’t about right or wrong anymore, there are so many “right” ways of doing things. So when the other person isn’t in a place to see that their way isn’t the only way of doing things, I can extend them grace and I don’t have to go into a big discussion about why I’m not doing anything wrong, because in Jesus I am secure and since he sees me and knows me and says I’m good, it’s ok if other people don’t see it. There were other things that were stretching as well, having cold showers, washing my clothes in the sink, sharing a room with 3 other women for a month, sleeping on a hard bed, having all kinds of sounds going on at night, smoke and dust and smog always being around you, a blanket that isn’t quite big enough for 2 people to share lol. So I was definitely looking forward to my own bed and room again. That shower that stayed warm the whole time was also nice. My thought going to bed the first night was, “ooh, this is comfy” and the second was, “wow, it’s SO quite” then I slept soundly until 7am lol. It took 3 washer rounds for the same load to get the smoke smell out, and 2 showers to get the smoke smell out of my hair lol. Overall though, Mongolia was so great. I really enjoyed going to the countryside, it was SO beautiful. Green hills and mountains as far as you can see, wild flowers everywhere. Sheesh a girl could get used to that! God is also doing so much there. The people are so open and hungry! It was so encouraging to see so many people come to know Jesus! Our team brought many to the Lord, saw multiple people healed physically, and made many friends where we were able to influence positively. Many more seeds were sown and I’m believing God when he promises to “finish every good work”! It was also encouraging to hear from multiple team members how well I did on the trip. Peaceful was the main word I got from people, and I have to agree with them. The peace of God definitely filled me and was the main marker of my time there. It’s also just nice to hear that you were a blessing to people on a mission trip where buttons are usually pressed and people are usually stretched outside of their comfort zones. I have so many things to be thankful for! Thank you so much for taking the time to be a part of my life. I’m thankful for all your support and prayers not only for this trip but also for my life in general. This trip would not have been the same without you praying. You also get to inherit so many good things from what God is doing in Mongolia because of you sowing in prayer! You are important. 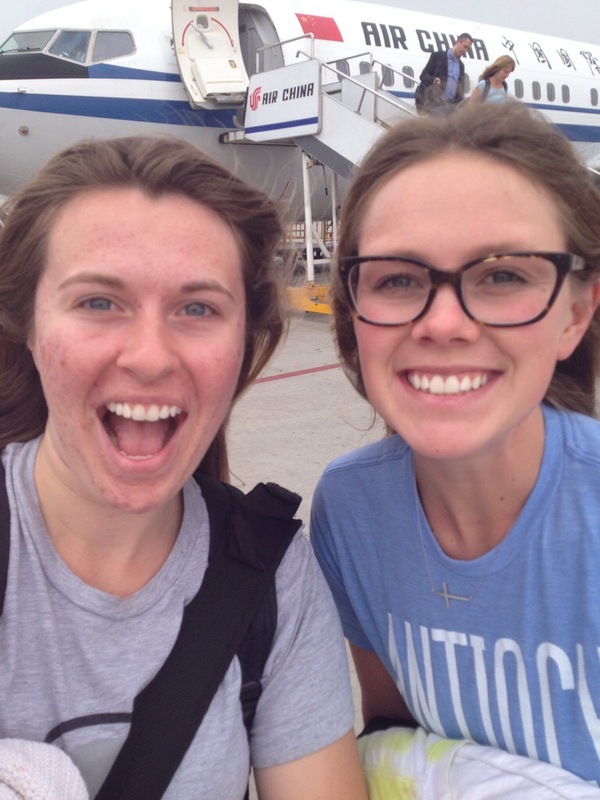 Just for fun, Here is a picture of my friend Kelsey and I on the tarmac next to our plane in Beijing for our 7 hour layover! Never gotten off a plane like that before! So fun!